2 packs of dry yeast which is equivalent to around 4 tsps. Mix all together until its desired consistency, I use my hands once they have been thoroughly washed, knead it for ten minutes and let rise for 20-30 mins. While I am kneading it I like to sprinkle in brachot (blessings) for our family and friends, sometimes I include names of those who need healing, to find a mate etc. Punch down a 2nd time, knead for another 10 minutes and let rise 20-30 mins. 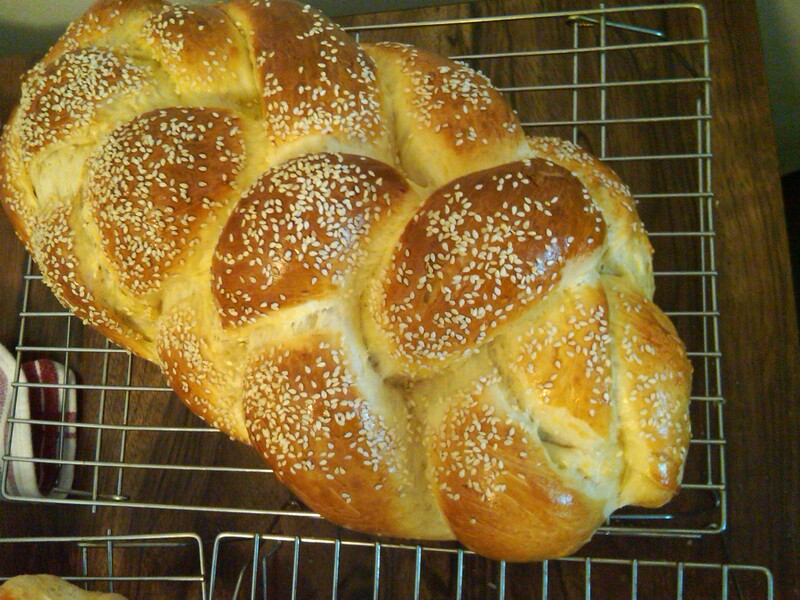 Take challah with Bracha, shape into the challah – either braided or round, and let rise again 20-30 mins. Brush with egg wash and sprinkle sesame seeds or poppyseed. Bake for 30 -40 mins depending on size of challahs. Set aside a part of the dough, use your fingers to shape and stretch it out to an oblong or square shape. Doesn’t matter if it isn’t perfect. Mix a cup of sugar with a decent helping of ground cinnamon. Sprinkle the sugar-cinnamon mix over the dough. You can add raisins too if that floats your boat. Roll up tight. Use sharp knife and cut 1.5 inch sections and place one by one in round pan, until the pan is filled. Let rise 30 minutes and bake 30 minutes. When cooled, drizzle with icing. My picture shows cinnamon on left, chocolate on right, both un-iced. Same as cinnamon except melt one cup choc chips with ¼ stick of margarine, and spread it out. My kids like me to sprinkle choc chips over it too. Instead of braiding, section off 6-8-12 (depending how big you want the pieces to be and how big baking tin is) identical pieces of dough. Mold into balls, place in pan next to each other, let rise. Coat with egg wash and seeds. Bake. Alternatively, you can belly button them. This means once all pieces are in pan use forefinger to make indent in each roll, and put choc chip / raisins / cinnamon sugar mix in. Rise. Bake. NOTE: My friend Shoshana taught me how to make challah and shared the recipe with me. I will always be grateful to her for getting me started on my way with this beautiful mitzvah. Just a note: If you are using instant yeast, i.e. the granules, you can mix the yeast straight into the flour. It doesn’t need to be proofed by mixing with warm water, nor will salt affect it. Totally gonna try this recipe for bobka. Does any challah recipe work? I’m so proud. They look gorgeous! You write up the recipes very well. thank you SR for the recipe. I think of you fondly whenever i make my challah. When did challah get so sweet? I grew up on Jennie Grossinger’s challah recipe which only had enough sugar to feed the yeast and I much prefer a more bread-like challah taste. Thank you Hadassah for this recipe! I just set it aside for its first rising. I was concerned though, because there was a lot of flour left in the bottom of the bowl after the dough came together in what I thought was the right consistency. Is that a problem? What should I do with that flour? Thank you in advance and good shabbos! Sometimes you just need to add a skootch more water – moisten your hands, really – to get that last bit of flour worked into the dough. This was amazing! I made the cinnamon rolls, and alosrt ate the whole pan! We also used the dough to make a Chicago style pizza! Yum!